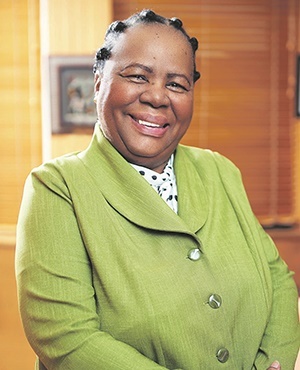 She registered for her degree in person, diligently attended lectures, defended her proposal after waiting in the queue like all other students and on Tuesday Higher Education Minister Naledi Pandor reaped her reward: she obtained a PhD from the University of Pretoria. The university said in a statement Pandor’s research topic was titled “The contested meaning of transformation in higher education in post- apartheid South Africa”. The work she produced has received acclaim from international examiners like Professor Fazal Rizvi from the University of Melbourne, who congratulated her on a “most insightful thesis”. Thanks to Pandor's thesis he now has a “more nuanced understanding of South African higher education and theoretical issues” he had not previously encountered. Pandor, a former teacher who already holds a Master’s in Education Policy and Practice in Multi-racial Societies, as well as Linguistics from the applied linguistics perspective, admitted to being nervous and “slightly embarrassed” at being an older student. She said she chose to further her studies in education because it fascinated her. “I learnt that there is a vast amount of absolutely fascinating education information that we need to tap into much more than we do today. I also learnt how to use research material and to carry out a very demanding academic schedule,” she said. “Every moment outside work and politics was given to my studies. I tried to balance [it] but some areas were neglected, especially family." Professor Chika Sehoole, Dean of the University of Pretoria’s Faculty of Education, was Pandor's supervisor. “After I agreed to supervise her, she set the rules for the relationship," said Sehoole, who was also a former colleague from before the education department was split into basic and higher education. He found it difficult to call her by her name, he admitted, but described her as a good student. Pandor said Sehoole was an “excellent supervisor" who built a positive relationship with her. "He knew when to advise or support, when to apply pressure, and when to leave me to my own devices." The former Science and Technology minister said in one of her department's budget speeches in Parliament five years ago that South Africa was producing too few doctoral graduates. Then there were just more than 1 800 PhDs per annum, City Press reported at the time. Pandor said the National Development Plan sets a target of 100 000 PhDs by 2030 to improve research and innovation capacity. To reach that target, there needs to be 6 000 PhDs per year. Academy of Science of South Africa president Professor Jonathan Jansen has hailed Pandor’s accomplishment.